Queenstown is a very touristic town all year round - summer through winter. This is the destination for South and North Island skiers and snowboarders alike. This is the number 1 international destination for adventure sports and activities. Jump from a plane, throw yourself from a bridge, or just chill out by the lake - the options are boundless. Queenstown is a 45-minute flight or roughly 6-hour drive from Christchurch. Nearby areas of interest include Milford Sound within Fiordland, Wanaka, Cromwell, Glenorchy, and Arrowtown - all part of the extraordinary Southern Lakes region. 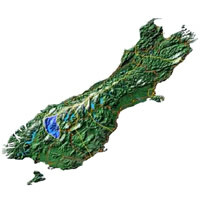 The Waitaki Valley and Mount Cook each are about three hours' drive from Queenstown. Our range of Queenstown Combos products provide you with the opportunity to combine many of New Zealand's 'tourism icon' attractions into your itinerary. They are designed for all levels of adventure offering you better value and improved use of your time. From the comfort of the state-of-the-art Jet boats Thunder Jet offers guests one hour of high-speed adventure as they get up close and personal with the dramatic alpine scenery. Traversing over 47km of waterways on Queenstown's Lake Wakatipu and Kawarau River you'll experience exclusive untouched wilderness surrounded by spectacular mountains and sheer cliff faces. This organized tour for a morning in Queenstown visits some of the biggest attractions in the area. This is a wakeup call experience in a morning including views from Queenstown Hill, AJ Hackett's Bungy jumping bridge, Gibbston valley wine tasting, Kawarau Gorge Lord of the Rings filming location, Arrowtown visit and the jet boating Shotover Gorge. Whether you want to challenge your boundaries or are solely looking for a relaxing and unique way to see areas of our great wilderness that lay off the beaten track, we can cater for you. Our fun packed packrafting day trip is created as an overall outdoors experience. Hike, climb, swim, play, raft or simply float and take in the breathtaking scenery, armed with your own paddle, a packraft and walking boots the opportunities are endless. Queenstown Wine Trail offers personalized tours with knowledgeable experienced wine guides, at the helm, ensuring that guests have fun and enjoy a premier wine tasting experience. Travelling time is kept to a minimum between wineries with the emphasis firmly on indulgence - in luxurious world class wines, locally made tasty cheeses, an optional scrumptious winery lunch, and unwinding among stunning South Island scenery. Ski or ride at the Remarkables. For beginners, novices, youth and entire families The Remarkables is the natural choice. Its high alpine location, north facing sunny aspect, fantastic terrain parks, great snow and friendly, relaxed nature makes it a true alpine experience for all ages. A list of popular different activities in Queenstown: Bungy-jumping, Rafting, Jet-boating, and many more. Sunrise Balloons have the expertise and knowledge to make your trip a truly everlasting experience. Experience the unique sensation of floating with the breeze! Get a bird's eye view of filming locations used in "Lord of the Rings" Wonderful photo opportunities with views of the Southern Alps and lakes. After a spectacular sunrise, indulge in a glass of champagne. A magical journey into the untouched wilderness of a World Heritage Area. The Safari is a jet boat, forest walk and back road combination, allow 6 hours from Queenstown. Funyaks is a full day and includes jet boat and inflatable Funyak canoe. On both options you'll see Paradise, film location for Lord of the Rings. Multiple Tourism Award winning Qualmark endorsed four wheel drive safari company. Unparalleled products - from Middle-earth experiences with our safari of Lord The Rings tours to original adventures in the high country exploring the old gold pioneering settlements of Macetown, Skippers Canyon and The Dart. It takes a certain kind of person to jump out an aircraft from 15,000ft. It takes courage. Harnessed to an experienced jumpmaster, expect sensory overload as you reach terminal velocity/200kph. The personal challenge is immense! Located amidst the most breath-taking scenery in the world. Achievement doesn't come sweeter! Set against a backdrop of The Remarkables Mountain Range and nestled on the shores of Lake Wakatipu, Queenstown is a picture perfect alpine paradise. The many exciting activities available in this natural playground have earned Queenstown the reputation as the 'Adventure Capital of the World.' The Helicopter Line offers a range of scenic flights to suit all itineraries. The flight from Queenstown through the Southern Alps and into the majestic Milford Sound is internationally acclaimed as one of the most magnificent flights in the world, with spectacular views of the World Heritage Area and Fiordland National Park. Your flight connects with Mitre Peak Cruises so you can discover the sights and sounds of one of the world's most famous waterways. Warm up at SKYCITY Queenstown with Jingo. Test our musical knowledge with the most hilarious sing-alongs and the best vibes! Great prizes and FREE entry. Doors open 7pm.